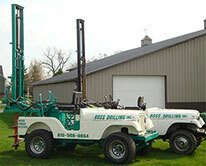 Boss Drilling, Inc. is a family owned and operated business headquartered in Maple Park, IL. The founder saw a need in the market for a one-stop shop for hole drilling and auger services where the customer received not just a drill or auger equipment rental but a service providing both. He was surprised to find this service was not readily available and created Boss Drilling to this end. The owner has 30 years experience operating a business and a reputation for making customer satisfaction his number one priority. His professionalism and expertise provides Boss Drilling with a steady stream of customers based on referrals and testimonials of his work. We promise to provide you with a guarantee of satisfaction. We work closely with our customers offering them the security of knowing they are hiring a fully-insured professional backed by years of experience. We are fully bonded and insured with a commitment to safety. Call us today to schedule an appointment. We stand ready to take your call and respond promptly to your needs. Office hours are 8:00 a.m. to 5:00 p.m. Monday through Friday. Please leave a message if you call after hours. We work 7 days a week in the field and can accommodate your needs. We serve all of northern Illinois. If you have a large job out of this service area please contact us. When you hire Boss Drilling for your job you can count on many time and cost saving benefits. Read more about what we call "The Boss Benefit".